Some of you know that I am a big fan of Little Free Libraries - those little cabinet-like structures built to hold ~20 books in some random nice person's front yard. They're all over the world now and the trend is growing like crazy! Well this year, I'm happy to say the LittleFreeLibrary.org site re-vamped their map page. It used to list every LFL on the planet and took FOREVER to load, but now you can narrow the list by city or state. So it makes road tripping so much easier! And yes I confirmed that if you're on a road trip, you can leave "city" blank, just put in a state, and the filter will be happy. 1) Visit libraries in my area to see who's got a surplus of books - some of them are loaded up like slide lock puzzles, crammed shelves of books with more books shoved on top. This tends to happen to LFLs in "nicer" areas, hate to say it. 2) If a library is "basically full" it's considered impolite to borrow more than 2-3 books. But if it's crammed full? I don't feel so bad about taking a few more. Especially ones they probably won't miss... beat up paperbacks, western fiction, reference books. Trust me you are doing them a favor. Kids books are considered premium so only take those if it's really crammed or you're really going someplace in need. 3) Then on your next road trip, plot out some new libraries. Take a box of books, either from LFLs in your area or from your own collection, and stop at as many LFLs as you can. Bonus points if it's a library in a crappy tiny town - I've found that those are the ones most likely to have more space. And keep the circulation going. If you want, grab more books from those libraries and take them back to your town just to get some new titles in there. Most LFLs have a stock that changes fairly regularly but not all. If you're in doubt about whether it's okay to take books, knock on the door of the steward's house or shoot them an email to ask how they're doing (many of their emails are on the LFL map website). Maybe you'll find something awesome to read, maybe you'll find something downright silly like that coffee table photo book we found of the Jonas brothers tour, either way you'll hopefully get to see some really cool new library designs and share your love of literature with more awesome people from around the country. There's one of these on the next block, and I love it. :) It's mighty empty right now though, so I ought to take some donations down there. I have heard of these libraries but don't think I have ever seen one. I will check out the site to see if I can find some nearby. Wow, there's one about 10 minutes away from me! That sounds awesome for children's books. I wish I could start my own since I have two shelves worth of books that I would love to get rid of, but you can't really do it when you have an apartment. I'm in the same situation. I would love to start one, but we rent. Plus, we move every couple years or so. Maybe once we find somewhere permanent. 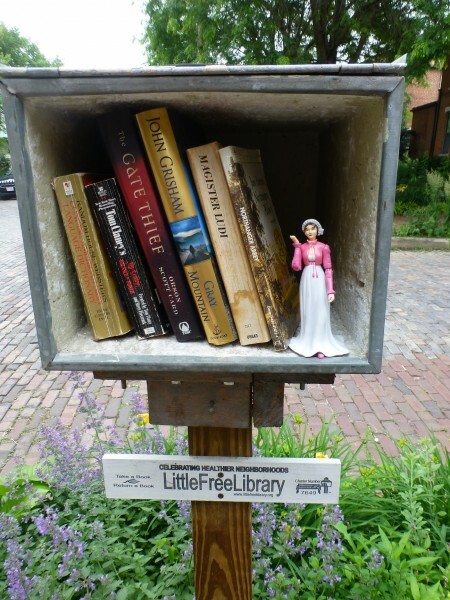 Little free libraries! Seshat bless this post. Wow, there's one near me! I've been downsizing my library, so this will be a perfect place to send some of them. Thanks! Thank you for posting this! My partner has been thinking about building one of these. I'm not sure he knew there was an official registry option. I sure didn't! I'm pretty sure this will be my next learn-to-build project. They have kits on the LFL website, but they're all priced as an investment (which it is, but I'd still like to take on the challenge of self-designing). we've helped build some and they're a blast! and made with small shelf-sized bits of wood, so you basically ask "who's got leftover plywood from a deck project?" and everybody responds and you get reclaimed, unused wood for free. very sustainable. last time I think we spent $30 on a sheet of plexiglass for the door, some hinges, and a post for the ground... nowhere NEAR the $400 plus shipping they charge for a library! Plus when you build it, they're unique. More people have been buying them lately, they're starting to run together. I like artsy ones. What would you do if a book turned up in your library that you really disagreed with (such as a book explaning why blacks are basicly evil or maybe a recelt popular title about a degrading and exploitative relationship)? I allow most books, I think people should make up their own minds, even when it comes to degrading and exploitative relationships. There's a lot of debate about the 50 Shades series - if there's debate, then I think readers should read. The only things I chuck into the recycle bin are religious end times spam. I don't like people putting stuff in our library with an agenda, and as a Christian I think the "repent or burn in hell forever!" message misrepresents what my religion is about.